We got a new washer and dryer yesterday! OH MY GOODNESS. I think I am in love. Yes, with my washer and dryer. Don’t judge. Let me back up. Our old washer and dryer were… interesting. Our dryer is… I don’t know how many years old, at least 10 or more. Not that that is SUPER old, but it was one of the cheapest ones you could get at the time. It wasn’t a “big” size… and with 4 kids now… we needed a bigger one. To top it off, it took 2 to 3 drying cycles to dry one load of clothes. It probably could have been fixed… but given it’s age and the fact that we really needed a new one anyway that fit our now larger family, I didn’t want to put any $$ into it. Our washer was a hand-me-down from my brother-in-law. I have no clue how old it is… but it looked like it might predate ME. It worked—but I always questioned exactly how clean it got our clothes, as it was a bit dirty looking itself. It also liked to get uneven regardless how even the clothes in it were. My walls have the dents to prove it. Through a strange series of events that are too long for this blog, we had the opportunity to purchase a new set. I still needed to be frugal but wanted to get one that wouldn’t just “do.” but that would fit our needs. Every time we went to Lowes, there was this dream set. I would walk in and it’s like that crazy moment when all the lights in the store would dim and a spotlight would shine directly on its pretty shiny paint and harps would play…..
Not really, but you get the idea. I literally DROOLED over them. It was the most expensive they had, so way out of my league, but you can’t stop a girl from dreaming! A few weeks ago, it went on sale for a really good price ($200 off each of them, total savings of $400), but still more than we could spend. We get there, and it’s no longer on sale. Only a $200 rebate if you bought the pair, thus making it $200 more than the week before. I was bummed, but it was just God saying no, so decided to be okay with it. I think God likes to be involved in our lives, even little details like what washer and dryer we buy. He knew the perfect one for our family, and I trusted that we’d know it when we found it. We looked at others, but considering the sales price the other one HAD been, they just didn’t look like good deals at all. If you know me at all, I am REALLY REALLY REALLY in love with good deals. So, we turned around to leave, when out of the corner of my eye, something snatched my attention. I walked a few rows over to see MY washer and dryer… the one I dreamed of… sitting on the clearance aisle. They were marked to each be $100 off what the old sales price had been. 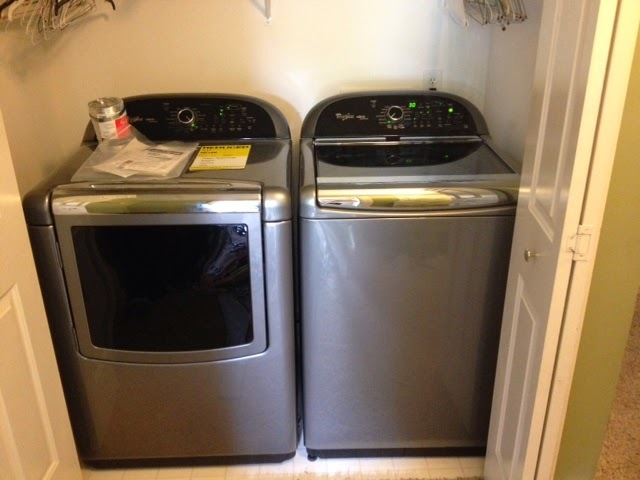 They weren’t damaged or defective/repaired, just marked “used.” Turns out, someone else had purchased a washer/dryer, had issues with it, and while the store was waiting for new ones to come in, they had “loaned” them this new set for 3 days. They’d only used it once or twice. So therefore, we got our SUPER nice washer and dryer for $600 off the list price! AND! That’s not all… The sales guy told us because it was clearance, we probably wouldn’t get the $200 rebate that it was now on it. I hadn’t expected to, so no biggie. Except when we got to the register, our rebate receipt printed off! So once we get the rebate back, we’ll have gotten $800 off our dream washer/dryer! God taught me a few things through this. 1.) While we don’t always get our dream “thing” that we want… sometimes God likes to give us that little extra, because He loves us and likes to see us smile. 2.) Good things come to those who wait. We could have replaced our washer/dryer a while ago with a cheap pair that worked. But it wouldn’t have fit all of our needs, definitely not any of our “wants.” Sometimes God gives us seasons in life that seem frustrating and have lots of issues, but if you have patience and wait, the result will be much better than you could have imagined. Washer and Dryer issues are just a tiny thing, but I think the lesson can be applied to a lot of things in life. 3.) Laundry can be fun. My washer has a clear lid and drum light. Seriously, my kids sit there watching clothes wash in awe. I, ahem, might have spent a few minutes watching it myself….. Discussion: Have you ever “made do” with something, only to have God show off and provide above your wildest dreams? Oh, and front loaders or top loaders…. what’s your pleasure? I wanted the top loader… and couldn’t be more happy with it! what kind are they? I will need to buy a washer and dryer in about 4 weeks when we move back stateside. Great job on the price. Hope I can get a good deal too. I want a top loader. Oh my goodness! K.P., that is my dream set too!!! I totally understand the drooling-at-Lowes experience! I love buying Lowes appliances on clearance! If it has a yellow sticker, THEY WILL HAGGLE! That yellow sticker price is not the lowest they'll take! I might know this from buying a clearance washer and refrigerator at 8:55 on a Friday night in April 2005 while having contractions in front of the Lowes appliance manager guy. He pretty much told me I could pay whatever I wanted if I didn't have my baby (Jackson) in his store. I still have that washer, and our renters are still using the fridge! We probably could have haggled some, but it was super late at night, not sure manager was still there, and it was already a LOT more off than they usually do. I think because it had been on sale the $200 off each just a few days before, it was probably discounted while on sale, thus the reason it was so low. There was no damage at all to them, and usually those don't have as much of a discount as the ones that have a dent in them, or have been repaired. So yeah, I'm pleased with my price! Oh, and right now I'm eyeing my dream dishwasher. Mine is old and has gone out, so I'm hand washing five people's dishes (including kids who never remember to reuse anything). I had a doctor appointment with a specialist next Tuesday the 22nd. I have had the appointment for almost a month. My oldest son left around the first of the month for sergeant training with the Army. I found out after he left he was graduating on the 22nd also 1 hour after my appointment. I called today just to see if they had any cancellations this week so I could go to his graduation. I have an appointment at 9:30 in the morning! It is hard to get in with this doctor. WOW!!! It is HARD to get in with specialists, that's pretty amazing!!! We bought our very first new couch a few years back, after about 15 years of marriage and having only ever owned hand-me-down furniture. The store had to order it in the color we chose. We decided to finance it because they were offering no interest financing if paid within 6 months or something like that. So it was do-able, but still a little nerve-wracking to me. Well, we get there to pick it up and they bring it out for us to inspect before loading it, and lo and behold it is broken! The board on the bottom of the back is snapped. So they said they could re-order it or they could offer it to us with a huge discount. We took it as is, and my husband repaired it. And besides, since we were putting it against a wall, you would never see the broken part anyway. I considered that broken couch to be a gift from God, and he has blessed me several times in similar ways. I am glad you have had a similar experience! Oh yes! Honestly, even had my W/D had a big ol' dent in the front, I would have been tickled! A dent pretty much matches our crazy family anyway (and will probably be there not too long in the future anyway!) Although…. I would have negotiated lower, HA HA HA! I'm going to live vicariously through this, Krista. We are trying to buy a house and ran into some big obstacles. So I love this story/reminder of God's desire to bless us-in His time. Charise, buying a house is SOOOOOO Stressful! I stressed just in refinancing last year! Praying God works his ULTIMATE plan and …. well, I'd pray for patience, but how about peace instead?? ?